Over at the ATC for Beginners Yahoo group, this month's lottery theme was picked by one of our long standing members, Barb from Holland. 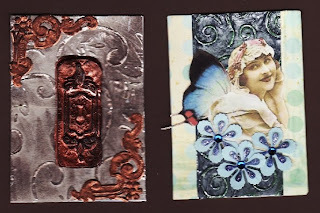 Barb gave us some links to look at this wonderful Faux Metal technique so I had to go about and do some ATC's. I have used silver tape that they use to tape duct work together but this is not the normal duct tape but the shiny silver stuff with a peel off backing or you can use tin foil. 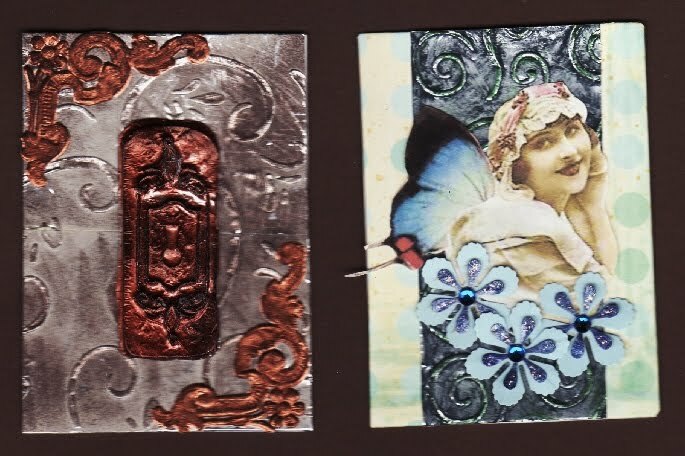 I embossed the foil tape then painted it on both card backgrounds, then I used StazOn ink to rub on the raised areas. The key hole was a different type of faux metal technique. My friend Becky a couple years ago found these lock and key paper embellishements and I like them so much I just keep them around to look at them. LOL Well I took one of the locks and layed some tin foil on top and took a Q tip and more or less rubbed the foil into all the cracks and crevaces to reveal the detail. Carefully lift off the foil when all the embossing is done, heat up that glue gun, fill the mold part of the tin foil with your hot glue. Let set and cool. Trim excess foil. I then painted the foil with a bronze metallic Folk Art paint with a couple coats. Then I just inked the raised edges with brown StazOn. It now looks good and rusty. The German scrap on the corners was a bit to brassy looking so I hit it with the brown ink too. This was a lot of fun Barb and thanks for the suggestion. You are so creative. These are really neat! Oh, how lovely these are! Very special. Very nice, Les, wonder if the vinyl that we use at the shop would work the same way? I'll have to try to remember to send some to you. These are so pretty. I am inspired by your art. The technique brings the metallic look to a whole new level. I love the richness. I'll denfinately use this method! Thanks girls for sharing.